Taking note of the Citizenship(Amendment) Bill pending in the Rajya Sabha, the Supreme Court today adjourned the hearing of a PIL which challenges the orders issued by the Central Government making way to grant of citizenship to illegal migrants. "If the Parliament passes the bill, your petition will become infructuous. Should we entertain at this stage or keep it pending?. Once Parliament passes the bill, nothing survives.The best we can do is keep it pending," CJI Gogoi said. It was hearing a PIL by Guwahati based NGO Nagarikatwa Aain Songsudhan Birodhi Mancha (Forum Against Citizenship Act Amendment Bill) filed through Advocate Manish Goswami,in which it was alleged that the "uncontrolled influx of illegal migrants from Bangladesh to Assam has caused huge demographic changes in Assam. The petition lays specific challenge to the Passport (Entry into India) Ammendment Rules, 2015 notifed on 07/09/2015, The Foreigners (Ammendment) Order,2015 notifed on 07/09/2015 and S.O 4132 (E) dated 23/12/2016 issued by the Ministry of Home Affairs. The cumulative effect of these rules is that Hindus, Sikhs, Parsis, Jains, Buddhists and Christians who migrate to India from Pakistan, Afghanistan and Bangladesh will not be treated as 'illegal migrants'. They are exempted from the application of Foreigners Act, 1946 and the Passport (Entry into India) Act, 1920. The exemption is available to migrants who came to India before December 31, 2014. The petitioners contend that the government orders distinguish migrants on the basis of religion, and make religion a basis for claim of citizenship. "It has introduced religion as a new principle into the citizenship law and can be conveniently branded as 'communally motivated humanitarianism'", says the PIL. The illegal immigrants who are to be granted the benefit of this legislation are to qualify for citizenship only on the basis of religion; which goes against one of the basic tenets of the Indian Constitution, secularism.The indigenous people who were once the majority has now become a minority in their own land, the petition says. 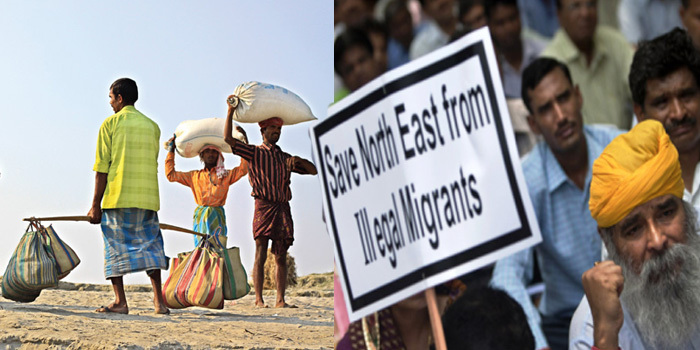 The petitioners further submit that the government orders violate the Assam Accord, which treated all those who entered the state after March'1971 as illegal immigrants. "The amendment defeats the purpose of the accord and opens the floodgates to more illegal immigration and consequently increases claims on diminishing resources. The transformation of migrants, hitherto perceived as illegal encroachers, into legitimate citizens cannot be justified. ", the PIL states. The proposed amendment to Citizenship Act, which was cleared by the Lok Sabha last week, makes non-Muslim migrants from Pakistan, Bangladesh and Afghanistan persons eligible for Indian citizenship. In that view of the matter, the SC observed that the PIL will become infructous if the Rajya Sabha clears the Citizenship(Amendment) Bill in the impending budget session.